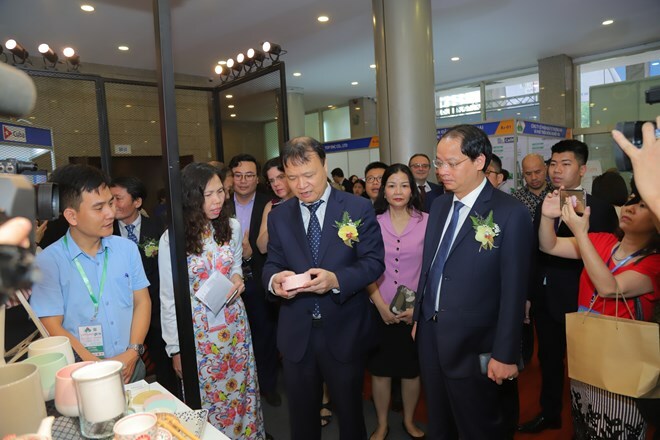 Hanoi (VNA) – The Vietnam International Trade Fair 2019 (Vietnam Expo 2019) returned to Hanoi for its 29th edition on April 10, with a wide range of products on display, including machinery and equipment for the supporting industry, electronic goods, agricultural products, and food and beverages, among others. Speaking at the opening ceremony, Deputy Minister of Industry and Trade Do Thang Hai stressed that the annual Vietnam Expo has become an important trade promotion event for Vietnam’s industry and trade sectors, and gained considerable prestige among domestic and international corporations. The four-day event, themed “Vietnam Expo-Enhancing Regional & Global Economic Links”, has featured 600 booths of 500 enterprises from 23 countries and territories including Algeria, Cambodia, China, Cuba, Indonesia, the Republic of Korea, Poland, and Russia. Notably, a special pavilion run by the Vietnam Trade Promotion Agency plays an important role in promoting investment in industrial development. Besides updating enterprises on Vietnam’s business climate, it is introducing foreign investors to eight key destinations for investments, such as Yen Bai, Hai Phong, Hanoi, Thanh Hoa, Binh Thuan, Vinh Long, Dong Thap, and Kien Giang. Meanwhile, the Vietnam-Korea Design Centre’s pavilion highlights the significance of design in product development, and popularises high-quality products with excellent designs, creating opportunities for local and foreign firms look for partners. An array of activities are scheduled in the framework of the Vietnam Expo 2019, including a Vietnam-Russia business forum, a seminar on “Branding – A big step for Small and Medium-sized Enterprises”, and business matching booths. The expo, held at Hanoi International Exhibition Centre, expects to welcome over 15,000 visitors.